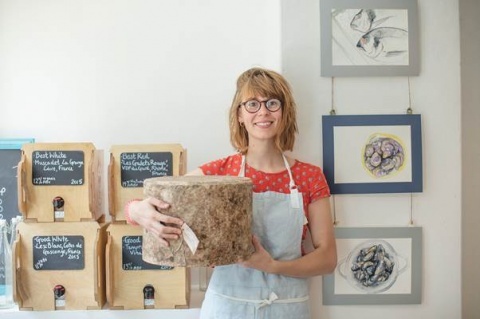 Rosie, The Bristol Cheesemonger is one of Good Sixty’s 50 High Street Heroes. Good Sixty launched in Bristol in late 2016, connecting people with the best independent food businesses in the City. Since then, the number of Independents you can shop with through the website has grown to 50, making it easier than ever for Bristol to ‘shop local’. Good Sixty’s vision is to help create wealthier, better-connected communities by helping award winning independent artisan food stores, cafes and producers compete online with the large corporations. The name Good Sixty is a direct reference to the fact that buying food locally from independent stores has a 60% greater economic benefit to the communities they serve than shopping from a large supermarket. As the breadth and depth of choice available online through Good Sixty grows, this vision is fast becoming a reality. Consumer demand for better, ethical, convenient food is at an all-time high and it has been proven time and again: shopping locally has a positive impact on our neighbourhoods, ploughing money back into the local economy and strengthening communities. Using the latest technology, the Good Sixty website allows busy people to browse and buy local produce online at any time and have it delivered to their door. Search for individual food businesses or shop by category. Greengrocers, wholefoods shops, vegan shops, organic shops, bakers, fishmongers, cheesemongers, delis, patisseries, wine merchants, micro-distilleries…the list goes on. Many of Bristol’s favourite street food stalls, cafes and coffee shops have recently joined the Collective too, so you can pre-order and pre-pay for a Pieminister Mothership, BearPit Social Toastie, or Pinkman’s Pizza at the touch of a button. It’s also a fuss-free way to order-in freshly prepared food for meetings, without having to resort to mass produced, supermarket sandwiches. Offering amazing customer service for both retailers and customers, Good Sixty is the perfect platform for anyone who loves good food and wants to support their local retailers and producers but doesn’t always have the time to visit their local independent shops regularly. Good Sixty’s High Street Heroes (the collective name given to businesses listed on the website), manage their own delivery slots and the majority of them now offer delivery to local homes and businesses throughout the week. Or use the ‘Click & Collect’ service – a great solution for people who can’t guarantee they will be at home to receive deliveries. The Good Sixty website profiles the owners of each food business listed so Good Sixty users get to know their High-Street Heroes. With a direct messaging function on the website the lines of communication are clear, simple and transparent. If you fancy your steak prepared in a particular way, simply send the retailer a message and consider it done! Items can be bought individually from every shop on Good Sixty but imaginative ‘Bundles’ add another interesting element to the Good Sixty shopping experience. At Source Food Hall choose from responsibly sourced meat or fish Bundles such as Roast Beef in a Box, Steak Supreme or the Protein Pack containing cod fillets, beef steaks, chicken fillets, free range eggs and organic Cheddar cheese. Infact Source offers pretty much everything you’d need for a weekly shop with dairy produce, fruit, veg and baked goods listed too. And everything you buy from this St Nicholas Market establishment is sourced as locally as possible – a common theme for all Good Sixty retailers. Other great bundles include ones from Scoopaway for bread, curry and cake-making. And there’s a 10% discount when you order Pieminister’s pie & mash pick ‘n mix for six (great for gatherings at home or in the office). If you’re entertaining, check out the West Country Dinner Party Bundles from The Bristol Cheesemonger or what about the perfect gin and tonic kits from Bristol’s very own micro-distillery, Psychopomp on St Michael’s Hill? Independent wine merchants and brewers are featured too, offering fine spirits and carefully curated boxes of wines and beers, including Grape & Grind’s Craft Beer Discovery Boxes, which showcase the best of Bristol’s beers. Browse and buy locally at www.goodsixty.co.uk Follow @GoodSixty on Instagram or Twitter. *Because ‘Every pound you spend with a local independent store, café or producer has a 60% greater benefit to your local community than spending it with a large supermarket’.